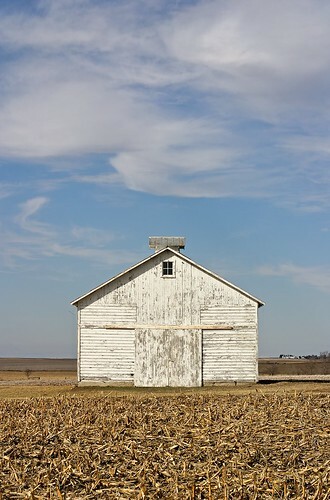 Corn Crib [ West Central Iowa], posted by Matt Niebuhr. The stark geometric form and color of these corn cribs continues to hold interest for me. Simple, direct, matter-of-fact (now useless) function. Slowly fading and exhibiting a quiet struggle with time and the scale of the farming today. This entry was posted in Buildings, Documentary, Matt Niebuhr - Photography, Photography and tagged crib, Iowa, Matt Niebuhr, Photography by Matt Niebuhr - West Branch Studio. Bookmark the permalink. Great texture, composition, and color on this one, Matt. I guess I can’t help but see these things by the road side where nothing much else is left but a patch of grass and maybe a lane leading up to the old building… I see these old things and can’t help but imagine the stories that might go along with them. I’ve been looking at several of your portfolio links and I’d have to say that the the plant/weed/grasses work grabs me the hardest. Nicely done. It’s difficult not to be drawn to barns. I’ve struggled with what to do with them myself -with a fear that I’ll create something to quaint. Yours have a stark straightforwardness, like sterile mugshots of bygone personalities. Glad you have the site. Thanks James. I also am concerned that the nostalgia and quaint appearance sometimes becomes too much in the barn photograph and so I’m still working them to keep that to a minimum. Your midwest photos are very striking. I am always interested in seeing what others notice and decide to photograph – especially if it is a familiar “image” in a new light. Terrific work, thanks for sharing! The video about disappearing landscape (change / potential) of Loudoun is full of challenging and provoking imagery about the notion of “how we develop the land”… Great Question: What is good land use practice?